The tattoos were the first clue. 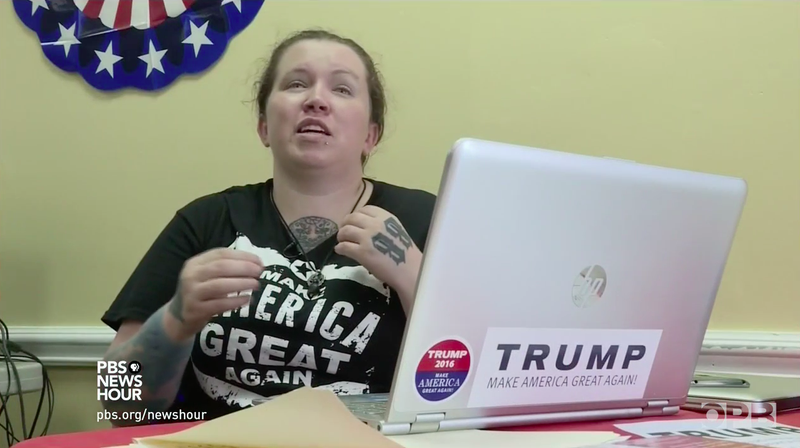 It's always heartwarming to see stories about people previously disengaged from the political process who get so excited about their candidate that they leap in with both feet and hands, tattoos and all, to volunteer for their candidate. Even if they do appear to be white supremacists. That caused Trump apologists to crawl out of the woodwork, crying that a Celtic cross is just not a leading indicator of white supremacy. Except, that's not all there is. And as the ADL explains, that's not just a pretty set of two 8s there. 88 is a white supremacist numerical code for "Heil Hitler." H is the eighth letter of the alphabet, so 88 = HH = Heil Hitler. One of the most common white supremacist symbols, 88 is used throughout the entire white supremacist movement, not just neo-Nazis. One can find it as a tattoo or graphic symbol; as part of the name of a group, publication or website; or as part of a screenname or e-mail address. It is even sometimes used as a greeting or sign-off (particularly in messages on social networking websites). It's sort of amazing that the PBS producers didn't catch this, but in a way I'm glad they didn't. This family is a prototypical Trump-supporting group of people.